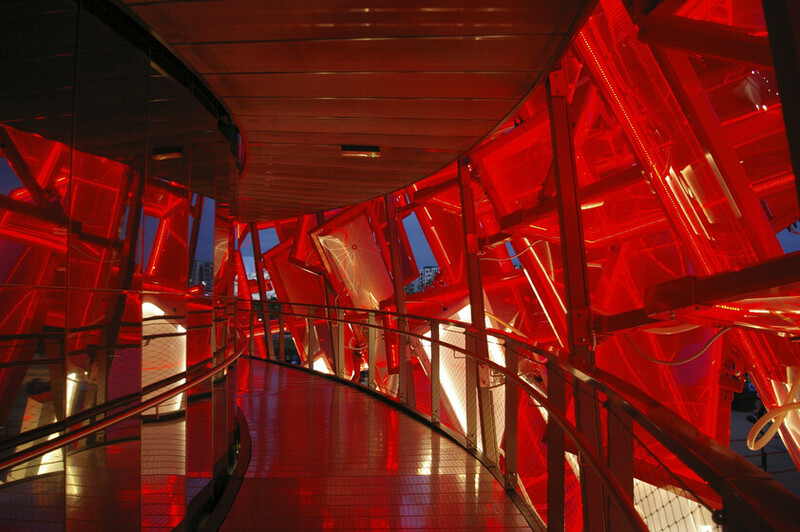 The brief asked for a cutting edge pavilion design that offers an extraordinary experience to sample and serve Coca-Cola to spectators. 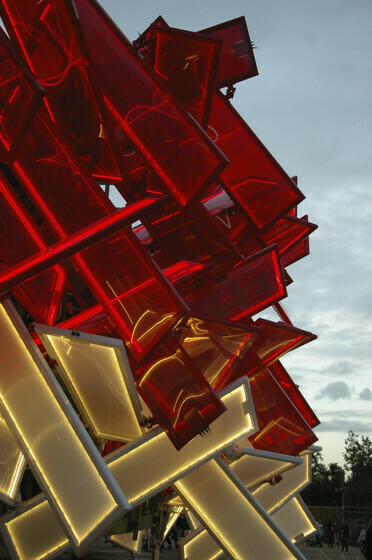 The Coca-Cola pavilion was envisaged as an architectural manifestation of youth, sports and music coming together for the London 2012 Olympic and Paralympic Games. The idea of the Coca-Cola Beatbox was born. 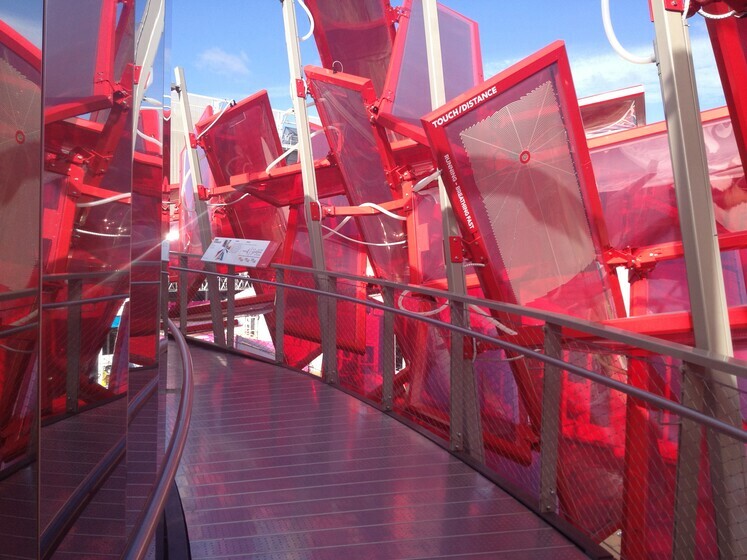 The Coca-Cola Beatbox uses sound as an architectural element. Through direct engagement with the pavilion’s envelope, visitors experience an ever evolving individual sound scape. The arrangement of the building’s fragmented envelope changes as the visitor ascends through a series of continuously evolving soundscapes being emitted from the cushions. The cushions are made from ETFE interlaced with exciter speaker technology that has been developed specifically for the Coca-Cola Beatbox. The visitors ascend the external ramp tapping the ETFE cushions on the journey to modify the sounds emulating from the speakers. The design, construction, operation, disassembly and legacy aspects of the project have been developed with sustainability as a key driver. The project followed the LOCOG sustainability guidelines and the BS 8901 for Sustainable Event Management. The environmental system aspires to utilise a Roman hypocaust system which uses a labyrinth constructed with coke cans to pre-cool the fresh air to the building. Thermal labyrinths are maze-like structures made from thermally massive materials which exchange energy with the 3057 air flowing through it. Typically, labyrinths are made from concrete, rammed earth, rocks or other high heat capacity materials. 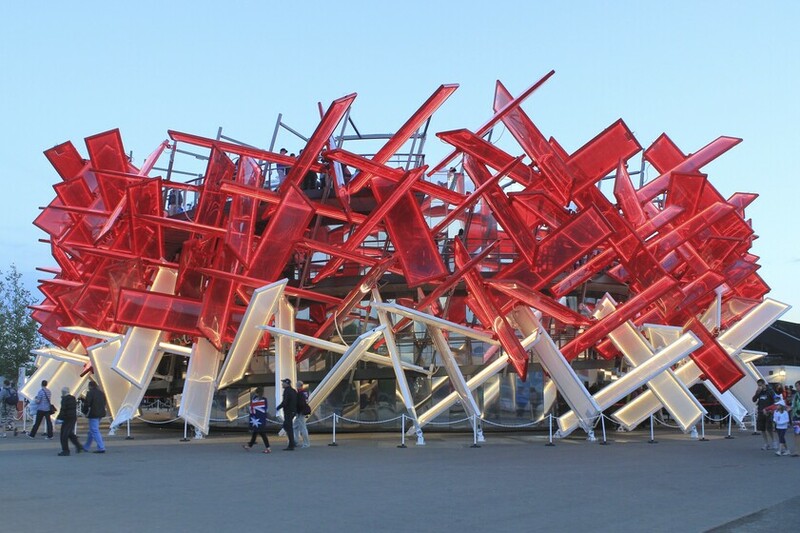 For the Coca-Cola Beatbox, it is proposed that Coca-Cola cans are used as the structural mass so as not to increase waste on site for the temporary structure. The liquid in the cans acts as a thermal battery, storing the chill of the night in order to reduce the daytime cooling load. During the day, the warmer daytime air is passed over the same cans where it is chilled before being delivered into the building. Thermal labyrinths rely on a diurnal temperature variation to provide the low energy cooling source. Generally, if temperatures regularly drop below 18°C at night a labyrinth is considered viable. During the summer night time temperatures regularly drop below 18°C, so a labyrinth is considered suitable for the London climate.